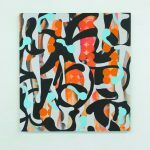 SUSAN MACWILLIAM DISCUSSES HER TOURING SURVEY EXHIBITION ‘MODERN EXPERIMENTS’, WHICH WILL HAVE SHOWN AT F.E. MCWILLIAM GALLERY, THE HIGHLANES GALLERY, UILLIN: WEST CORK ARTS CENTRE AND THE BUTLER GALLERY BY THE END OF 2017. It’s a strange experience when works come back after an absence, materialising from their coffin-like crates or emerging into the light after a decade or more in darkness and obscurity. A survey show feels like a form of mediumship. Past worlds collide in the present. These worlds are made by me, fabricated in the studio by different versions of myself at different stages of my life. 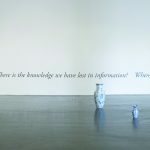 Some works ‘know’ other works, while others meet for the first time – converging like a gathering of relatives, mapping their family tree with regurgitated connectedness. The ancestors are here, having paved the way for descendants and works born of others. Having multiplied, they gather: siblings, cousins, great grandparents, aunts and uncles. Some are more assertive and demanding, while others lurk quietly in corners. Some take longer to get to know yet persist and linger. As the maker of these worlds, I feel as though I’m in the presence of ghosts: ghosts from the past; ghosts from the future. There’s a falling in love, a sense of haunting that occurs when I work with my subjects. There’s an intensity of knowing: of wanting to know, of wanting to know intimately, of observing, of watching, of looking closer, of getting under the skin, of wanting more. The works in ‘Modern Experiments’ are knitted together through entangled connections and the overlaps of subjects and lives. In making them, I’ve become investigator, participant and collaborator. Spanning 18 years, these works have taken me back and forth across the globe, to libraries and archives, and to places and histories unfamiliar and little-known. Shifting my position from behind the camera to the subject of its gaze, I’ve become both the observer and the observed. In 2005, in pursuit of knowledge of ‘eyeless sight’, I enter the underground Parisian laboratory of Madame Duplessis. I stand amongst dermo-optic boxes and coloured cards; plastic cups and measuring devices; fingers feeling through paroptic vision; voices overlapping, contradicting and concurring. I sense friendship, trust and camaraderie. “When I have finished my experience with Madame Duplessis, I feel much better,” Edith says. A year later, I’m in New York with the family of Irish medium Eileen Garrett. From Manhattan to Long Island and back, swept in and under their wing, engulfed in a whirlwind of histories and anecdotes. Back now to ‘Modern Experiments’, amongst this family of objects, images and moving pictures. 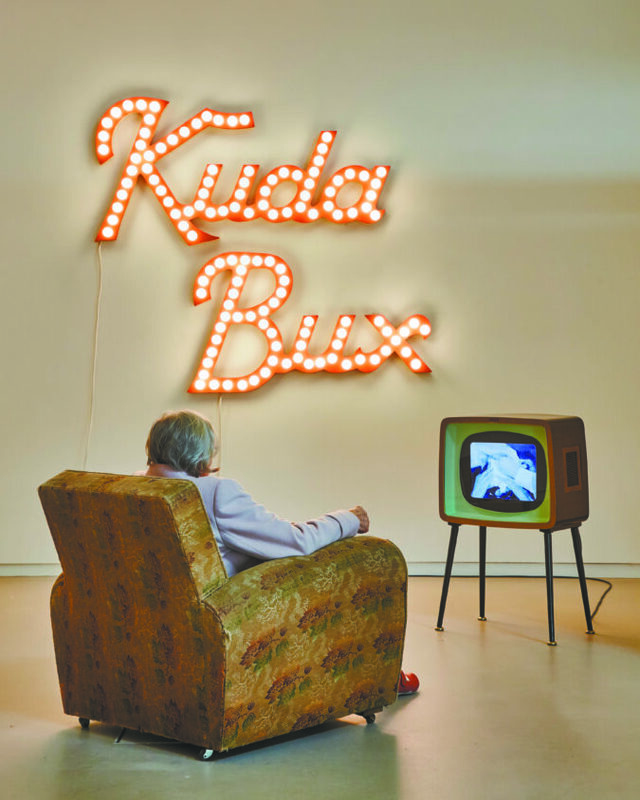 I’m sitting in a 1930s armchair, bathed in the glow of the multi-bulbed vaudeville sign that spells out the name “Kuda Bux”. Himself here now in front of me, his dough-balled eyes and turban-bound face incased in a 1950s television that endlessly loops. An inter-title informs that Kuda Bux “was made famous during the 1930s and ‘40s by his dramatic demonstrations of eyeless sight”. The detritus of ‘me’ becoming ‘he’ hovers: the reconstructed blackboard to my side, the lumpen rags at my feet. 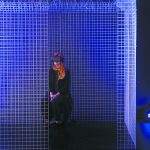 This theatrical installation sits within ‘Modern Experiments’, amongst its laboratories of propositions, its anthologies and analogies, and its curiosity of personalities. Elevated on a wooden stand, a monitor emits a gentle hum; from its cathode ray tube, the dark spaces of the Eileen J. Garrett Library open up. Elsewhere, the writer Kathleen Coyle transmits her inner thoughts through intimate earphones. ‘Modern Experiments’ is littered with the literary, and books abound: The Eternity of Time, Between Heaven and Earth, Unknown but Known, Extra-Sensory Perception. Kathleen’s daughter tells her: “Once you are there in that ESP atmosphere, the writing of your book should get on well”. Kathleen had hoped to get to Duke University to participate in the ESP experiments of J.B. Rhine. Her scribbled thoughts on a manuscript willing it to be: “going to get, going to get to Duke soon; going to get, going to get to Duke soon”. I’d already gotten to Duke before encountering Coyle and her desires to “get there”. In 2011 – amongst the folders, files and photographs of that ESP environment at Duke – my fingers find a telegram from 1934. Sent to Rhine on behalf of Garrett, its sticker declares: “AN ANSWER IS EXPECTED”. Answers can be found in books: shelved books, closed books, open books. In ‘Modern Experiments’ books become orbs, Garrett travels from Southampton to New York  and Kuda Bux performs. Across 19 monitors, my younger self, trapped in an eternal fainting loop, becomes a body observed, a body controlled. Birds sing, scissors snip, an air conditioner hums. Then a voice from a television declares: “You won’t believe your eyes …that which you are about to see, you will never forget”. Reason is ruptured, while white neon asks: “Where are the dead?” and Mrs C. wonders: “Well where does it go?” Questions asked, answers demanded; reproduction and reconstruction; close inspection and gathered recollection. Bill first met Eileen Garrett while he was a student at Oxford; I met Bill while investigating Garrett. Together now in ‘Modern Experiments’, Bill, Mrs C., Lisette and Garrett enter my orbit, some as spectres from the other side, gone but not gone, floating in the ether, their voices resonating, their personalities pervading. Bill says of Garrett: “When she enters a room, you know it… she’s a kind of sun around whom planets rotate, you know who’s the centre – she’s the centre”. On a screen on a shelf, Aldous Huxley’s eyes rattle and rotate. In his 1942 book The Art of Seeing, Huxley espoused the use of a raised hand to palm the eye in order to improve eyesight. The fainting girl raises her hand to her forehead: “Test, test, test”. Her body slumps. Arla reads how Hamilton “put his hands over the face of the medium… and said he felt nothing there…” Elsewhere on a monitor, Helen Duncan’s hands are bound to a chair. 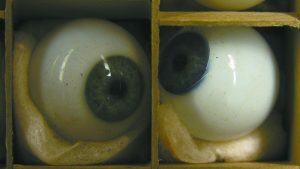 In 1920, Jules Romains described ‘eyeless sight’ in La Vision extra-rétinienne et le sens paroptique. Ciaran says: “You can see anything at all in anything at all…if that’s how you think”. In Winnipeg in 1931, teleplasmic letters emerge on a séance cabinet wall spelling out the name ‘Flammarion’. In 2008, I cross the Atlantic once more to explore the photographs of that teleplasm. Back here, now, in a corner of the gallery, my nephew Mercer – age five and still learning language – enquires about ectoplasmic rods, experiments and fraud. “Light leak, spool down, lens flare, split screen”. Audio overlaps and images regurgitate. “Life has a habit of coming up with repeated patterns,” Kathleen says. And Bill imagines three pictures of himself “saying the same thing slightly differently”. In ‘Modern Experiments’ patterns repeat and duplicate with doubling synchronicity. In 2008 I discover, on a ship’s manifest, that relatives of mine travelled to New York in 1934 on the same crossing as Garrett and her daughter. 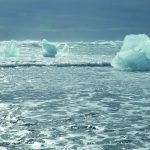 Kathleen observes how “life and living team with coincidences”. ‘Modern Experiments’ proliferates with relentless looking and intimate observation. A sequence of images unfolds across two monitors on the floor: an attic room wallpapered with repeated patterns; a view under a table; fleshy feet entering a wooden box. Exploring the possibilities of table levitation, W.J. Crawford crawls on hands and knees and describes how “the flesh of ‘M’ is converted into plasma”. Reason ruptures: “psychic stuff sent in fluxes”. Plywood platforms house scissor-wielding hands and Rosa Kuleshova is brought back to life in paper form. In ‘Modern Experiments’ dislocated limbs construct models and fingers feel. Bodies produce images, ectoplasm finds form and feelers extend: amorphous ambiguity… audio loops and layers… silence… webs weave… cameras observe… coincidence converge… These are the worlds of Helen Duncan, Kathleen Goligher, Kuda Bux, Eileen Garrett, Yvonne Duplessis, Flammarion and Kathleen Coyle. Susan MacWilliam is a Belfast-born artist based in Dublin and a lecturer in Fine Art at NCAD. 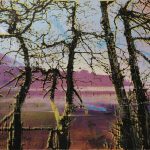 ‘Modern Experiments’ will be presented at Uillinn: West Cork Arts Centre, Skibbereen, from 9 September to 18 October and at the Butler Gallery, Kilkenny, from 28 October to 17 December 2017. Curated by Riann Coulter, ‘Modern Experiments’ is supported by a Touring Award from Arts Council of Ireland and Arts Council of Northern Ireland. Kuda Bux, 2003, video installation. Book Spheres, 2013/14, sculpture, installation. AN ANSWER IS EXPECTED, 2013, neon. The Only Way to Travel, 2008, video. Where are the dead? 2013, neon. 13 Roland Gardens, 2007, video. The Last Person, 1998, video. Explaining Magic to Mercer, 2005, video installation. Experiment M, 1999, video, double channel. 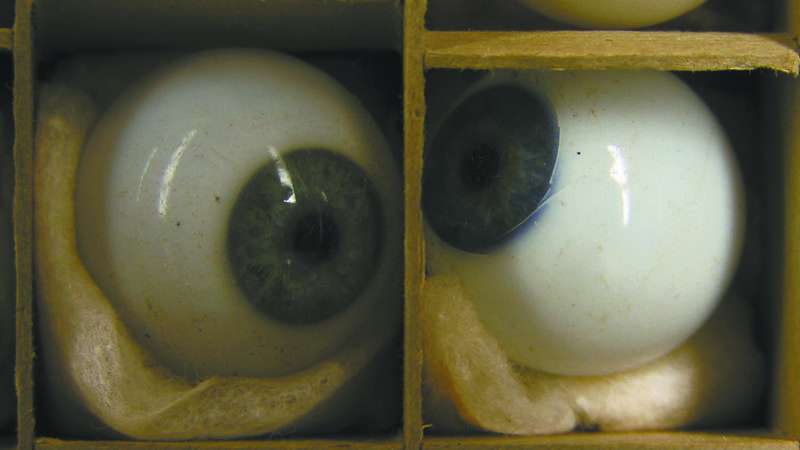 Artist as Medium, 2008, stereoscope. Images: Susan MacWilliam, Kuda Bux, 2003; installation view, F.E. McWilliam Gallery, 2017; photo by Simon Mills; Aldous’s Eyes, 2014, video still.